A corneal topographer can take your eyecare services to the next level–and enhance practice profitability. USE FOR CONTACT LENS & Rx SURGERY CO-MANAGEMENT. Aids in fitting contact lenses and assists pre-operative refractive surgery preparations. MAKE PART OF PRE-TESTING. All contact lens patients can benefit with health of cornea shown. ENHANCE PATIENT EDUCATION. Show images of cornea to illustrate need for further treatment or a change in contact lens wear and care regimen. A corneal topographer, which takes a topographic map-like image of the cornea, can allow for better patient care and aid in practice profitability. Patients see that you have the latest technology to serve them, enhancing your practice brand. Theinvestment in the instrument is quickly recouped–and then some. The corneal topographer has been a huge practice builder for me. Patients love that I can show them sharp images of their cornea. 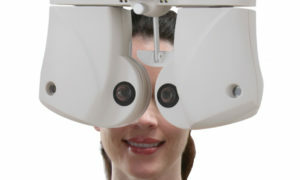 I feel it is a must for all contact lens patients, pre-LASIK patients and those who have previously had LASIK surgery. But more importantly, it is a way to significantly increase your revenue for other streams of income like keratoconus—irregular contact lens fitting, orthoK corneal shaping and refractive surgery co-management. For no more than $15,000, I invested in a corneal topographer that over the last three years has brought at least $180,000 into my practice. A corneal topographer is invaluable for any doctor who fits contact lenses and co-manages refractive surgery. I made money from day one of the instrument’s use. I use the corneal topographer as part of my contact lens exam. I charge every contact lens patient, along with every refractive patient for the corneal topography to evaluate the corneal tissue and the topography of the cornea. The corneal topographer is a key instrument to see if patients qualify for refractive surgery. The consultation visit is no charge, but when we do the pre-operative evaluation, images taken with this instrument are charged privately. Dr. White’s corneal topographer from the patient’s perspective. In addition, it is really nice to have this instrument when I am not able to refract a healthy patient to 20/20, their keratometer reading is steep or the cornea just looks different. I am instantly able to look at the cornea to rule out keratoconus or other corneal conditions and diseases. I have gone through three topographers, and the cost is coming down, so that you can now get a high-quality corneal topographer for $10,000-$15,000 depending on what software you get. The corneal topogrpaher I currently have is a lot better then the first topographer I bought at over $25,000. For tax purposes, I leased the topographer. I leased it three years ago.The lease payment is a fraction of what my revenue is for this instrument. It is a major revenue-generator for the practice, but most importantly, I am giving my patient the best possible technology for their eyes. In my office, cornea topography is usually a private pay test of $50. Lease payment for the instrument is $300/month. It takes six patients to break even and we do approximately between 75-100 topography tests a month. Do the math! That equals up to $5,000 per month from use of this instrument. Images are instantly produced on the corneal topographer, giving me the ability to immediately explain to the patient what is going on. A picture is worth a thousand words, as they say. Being able to explain to a patient something potentially serious is critical in these days of the internet. I don’t want patients to search online and get scared. I want to go over all diagnoses with them. I can even e-mail patients the image the instrument produces. I also can e-mail the lab for keratoconus patients, orthoK and corneal molding patients. Taking a minute to show patients a picture of their cornea, especially with keratoconus, and even for a condition as simple as astigmatism, lets them know the worth of the test and its value in helping me fit them in contacts or recommend surgery. We also take pictures with the corneal topographer after refractive surgery to show patients the health of the flap and cornea. The corneal topographer is now a part of our pre-testing area. We have a banana table with the Nidek Magellan Corneal Topographer, next to it the Nikek autorefractor/keratometer and Clear Path Diabetic screening unit. Next to the banana table is the Optos retinal camera. This instrument is incredibly easy to use. Training for staff and myself took no more than five minutes, as the system is mostly intuitive to use. We have a lap top hooked up to it, and it is very user-friendly.